The American Bulldog is a dog breed that was developed during the middle of the 20th century as a guardian dog and a dog that could help with the duties around a farm or ranch. While these dogs are originally descended from vicious dogs used in the blood sport of bull baiting, these overly aggressive tendencies have been significantly reduced over the years. Now, many people consider them to be just oversize lap dogs. Today, this breed of dog is probably known most for its good temperament and its jaws that seemingly drip endlessly with drool. 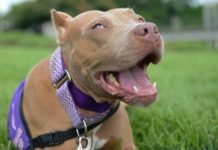 Unfortunately, in recent history, it has also unfairly received its share of fear and trepidation as its often lumped in with pit bulls and subject to the same irrational fears that pit bulls receive. Which is why I decided to try to change the public’s perception about this remarkable breed of dog. These dogs aren’t blood-thirsty killers but are loyal, confident guardians of the household who would do just about anything to protect their families, as you’ll come to see in this guide. These dogs can trace its roots back hundreds of years to England. This is when it’s forefather – the English Bulldog (which was descended from Mastiffs) – was bred to handle a variety of different tasks. It was originally used by farmers to corral cattle, chase off vermin and protect farms from predators. However, the practice of bull baiting began to arise during the 17th and 18th centuries and this ended up changing how the breed was used and eventually its physical characteristics. Bull baiting was an activity in which bulls were chained to a post and dogs were made to attack it. At first, the whole point of this activity was to tenderize the meat before it was sold because many people believed that the when the dogs bit into the flesh of the animal it tenderized it. It was such a common belief that many towns had laws that specifically required bulls be baited before they were slaughtered and sold to the public. And while it originally started out as a practice used by butchers, it would eventually become a blood sport in its own right. Fortunately, the practice of bull baiting would come to an end in England in the early 19th century. This is when people stopped breeding these dogs for this sport, which in turn caused the numbers of Bulldogs to eventually decrease. This could’ve possibly resulted in this dog breed line becoming extinct altogether if it wasn’t for immigrants who decided to take their work dogs to the New World. In the U.S., these dogs once again began to do the chores they were originally designed to do – herding cattle, killing pests and protecting farms and ranches. However, that didn’t protect them from almost going extinct during the beginning of the 20th century as their population continued to decrease. Fortunately, two returning WWII veterans – John D. Johnson and Alan Scott – decided to resurrect the bulldog lines. The two of them, along with a few other breeders, began to carefully breed these dogs. Eventually, several different lines emerged from their work, but the most prominent ones were the Scott and the Johnson lines. The Scott dogs were more athletic and had a leaner body. The Johnson dogs ended up being more of the “bully” type – meaning their bulkier, have bigger heads and have denser bones. These lines were eventually cross-bred and the American Bulldog was born. One of the most recognizable characteristics of the American Bulldog is its head. It has a head that’s not only large but also fairly broad. It has a muzzle that’s quite broad as well. On top of this rather large head, it has ears that can come in a variety of different shapes and sizes – from rose ears and drop ears to high-set ears, their ears may even be cropped. The jaws of this dog are usually a reverse scissor pattern with a moderate under-bite, but other types of bites are also possible. No matter what the bite pattern, however, one thing is for certain: this dog has a very powerful bite force facilitated by its powerful jaws. This dog is about 20 to 28-inches tall and weighs anywhere from 60 to 120-pounds. 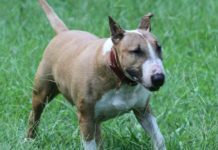 These dogs can come in a variety of solid colors, patch and brindle coats, with solid black or red being the most popular. 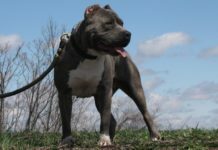 This breed tends to be quicker than English Bulldogs, despite the fact, that it’s a fairly-muscular and stocky dog. These dogs tend to have fairly-muscular necks and straight but heavy-boned front-quarters. Their hind-quarters tend to be muscled and thick. As for its tail, it tends to be set low, is usually thick at its base and eventually tapers off to a point at its end. American Bulldogs have a variety of characteristics which make them great dogs to own. The first trait that makes it a great dog is that while it has strong protective tendencies towards its master, it tends not to be a hostile dog. In fact, if these dogs are properly socialized, trained and treated well, then they usually turn out to be big lap dogs–content with just hanging out with their families. However, don’t mistake this genteel nature for it being a push-over. This breed of dogs is known as a guardian breed and will usually do whatever it takes to protect their families, even risking their own lives in the process. Another desirable trait of this particular breed of dog is that it’s extremely loyal. Of course, this can make them a bit stand-offish with strangers who may come close to their owners, but this shouldn’t be a problem in the dog was properly trained. These dogs are also really great with children though and exhibit the same protective characteristics they usually reserve for their owners. One thing that needs to be kept in mind, however, is that these dogs need both their minds and their bodies exercised on a regular basis. If they aren’t, then they may become excitable and even destructive. 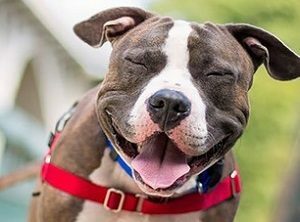 Like any other dog breed, the American Bulldog is prone to certain illnesses. While that means that it’s susceptible to certain conditions and illnesses, it doesn’t mean that it will necessarily develop them. It all depends on a number of different factors and not just genetics. One of the best ways to keep your dog living longer is by feeding it a healthy diet and making sure that it is well-exercised. And above all, making sure that your dog is happy. After all, a happy pet is usually healthier than an unhappy one. Two of the conditions this breed is particularly susceptible to are Ceroid Lipofuscinosis and Cherry Eye. Canine Ceroid Lipofuscinosis is a lysosomal storage disorder. What this means is that a dog afflicted with this condition lacks a necessary enzyme to breakdown waste products. These waste products will then accumulate in some of the dog’s cells and result in a deterioration of the animal’s motor functions and mental capacity. Usually, dogs with this condition can develop symptoms anywhere from 6-months to 6-years of age. Cherry Eye is a disorder of the dog’s third eyelid. It causes the gland in the eye to prolapse and comes out of the eyes as a swollen, red mass, oftentimes requiring surgery to correct. These dogs also have a couple of traits that I feel should be mentioned in this section. While these aren’t specifically health problems, they are biological functions that need to be mentioned. The first of these is this dog’s tendency to drool. While not every member of this breed will have drooling problems, the majority of them do and it can really look disgusting. Another thing is these dogs tend to be quite gaseous. Yes, they are usually very flatulent animals and some of them produce gas so nauseating that it can clear out an entire room. Like I said, not specifically health problems but definitely worth noting. 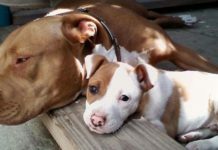 In some areas, these dogs are banned as a dangerous breed of their own or tossed into the pit bull category and banned on that premise. And even in areas where they aren’t specifically banned, some insurance companies may drop home insurance coverage on anyone who owns one of these dogs. So be sure to investigate all local and state regulations to make sure that you can own this dog without any legal consequence or liability. 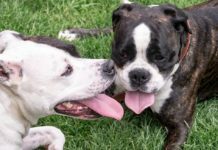 While the American Bulldog is truly an American breed, it is one that’s honored and adored all around the world. And that’s because these dogs have all of the characteristics we want in a dog. They are strong and loyal, confident and caring. They represent all of the high ideals that we look for in ourselves and each other. 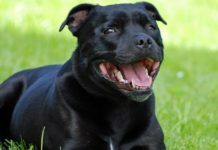 Sure, they might be a little gassy or might leave a little bit more drool on your face than other dog breeds, but they also are some of the best guardian dogs that you can own. While they might not be corralling cattle or chasing down feral hogs anymore, they do have a spot in your home, if you choose to give them a chance.